Trade is a cornerstone of Canada’s economy and society. The very idea of Canada was formed on the need to create a union based on trade and commerce. The fathers of Confederation agreed to reduce inter-provincial trade barriers as part of creating a nation because they knew it would help the promotion of Canadian exports and attraction of the foreign investment necessary to build factories and finance the railways to transport our goods to market. Today, virtually every aspect of our standard of living as Canadians -- most of what we eat, drink, wear and our modes of transportation -- is made possible by trade. International trade represents 60 per cent of our GDP, and one in five jobs is linked to exports. Quite simply, the wellbeing and quality of life of Canadians depends on our ability to trade and attract investment.1 A liberal trade policy has been and remains fundamental to Canada’s prosperity. Natural resources continue to anchor the Canadian economy and the monetization of these resources requires access to global markets. 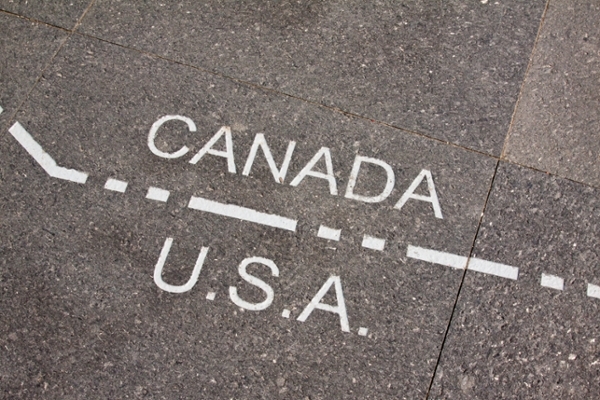 Canada ranks 12th in the WTO table of leading exporters, ninth as importers and 16th in trade in commercial services.3 Include interprovincial commerce, and 80 percent of the Canadian economy depends on trade – internal and external.4 Half of what Canadians produce is exported.5 For Saskatchewan it‘s approximately 70 per cent.6 The United States is the top market for both Canada and Saskatchewan, followed by China. In a world where trade linkages are an integral part of the global economy, trade has long since come out of the shadows and become part of the political dialogue. It is debate often framed by issues of sovereignty and self-determination, of economic efficiency and comparative advantage, of rich versus poor, developed versus developing nations. 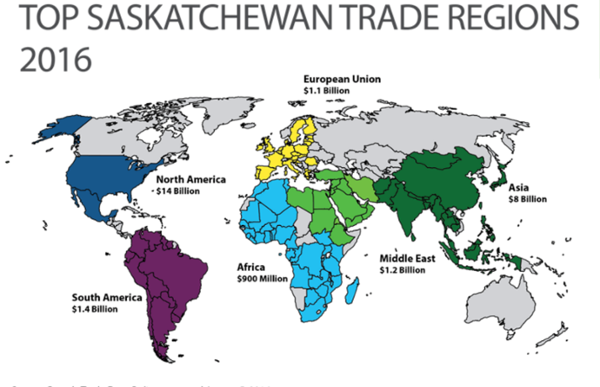 Figure 1: Top Saskatchewan Trade Regions 2016. In fora, like the World Trade Organization (WTO), OECD, IMF and World Bank, Canada often plays the role of ‘helpful fixer’ and bridge to consensus. For a trade-dependent nation like Canada, it’s obviously in our self-interest and the right thing to do. Canada draws most of its annual income from trade.16 So it is good trade policy to pursue the current effort to renew secure access to the United States, our most important market, through the on-going NAFTA negotiations. The same is true of the new trans-Atlantic and trans-Pacific agreements—Canada Europe Trade Agreement and the Comprehensive and Progressive Agreement for Trans-Pacific Partnership CPTPP—which seek to broaden and secure market access to Europe and Asia. Freer trade also became a catalyst for domestic economic reform. The restructuring included the introduction of a national valueadded tax—the GST—and the economic growth it spurred helped federal and provincial governments to reduce and eliminate their deficits. 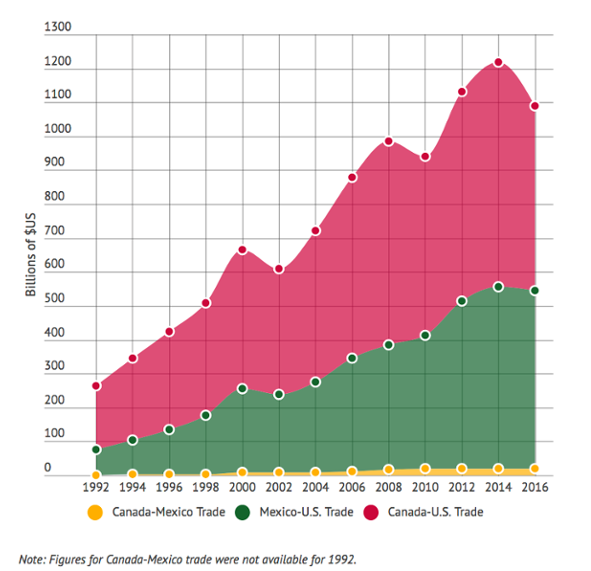 Since the negotiation of the NAFTA, the federal Conservative and Liberal parties have mostly shared a commitment to freer trade and have pursued this objective when in government. Can we preserve dispute settlement as a check against unfair protectionism? Can we find an equitable formula around trilateral content rules for cars, our most traded commodity? Will government procurement stay open to all three nations? If we cannot resolve these issues, then we have to look to life without the North American free-trade agreement. For Americans, NAFTA is a litmus test of its place in the world. For the first time, the most important global economy wants to renegotiate a trade agreement by increasing trade barriers so as to balance its trade. With preferred access to the U.S. in question, Canada must look to market diversification, which means broadening our trade horizon. The preferred venue for trade liberalization after the Second World War was the Geneva-based General Agreement on Trade and Tariffs (GATT), which eventually became the WTO as an institutional body to manage global trade. Negotiations among the WTO’s 164 members is slower and requires more compromises. But that shouldn’t obscure the fact that the WTO is as an important international forum for trade discussions and the court for settlement of member trade disputes. For now, serious trade negotiations are conducted either bilaterally or regionally. Like-minded nations are turning to regional agreements like the CPTPP or bilateral accords like the Canada-Korea FTA to achieve trade liberalization. Increasingly, they address ‘beyond the border’ domestic regulations, such as public policy choices on investment, dispute settlement, innovation, intellectual property and, for Asia, state capitalism. 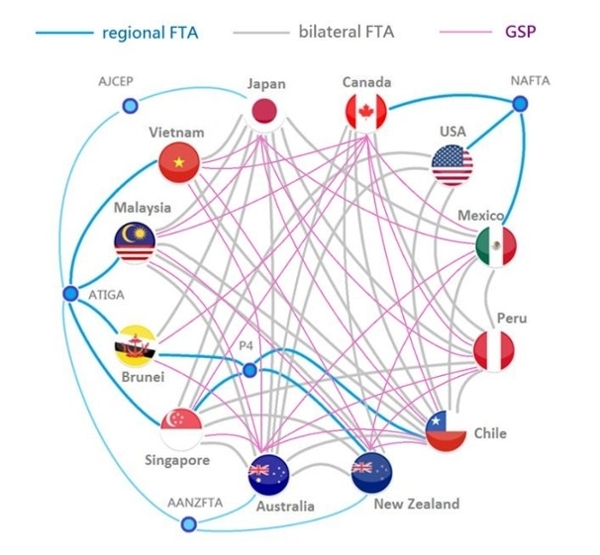 The result is a ‘spaghetti bowl’23 of different agreements, of which the recently negotiated CPTPP is a good example. Companies parse the different agreements for advantages relating to differing rules of origin or intellectual property protection. But good trade policy must also be coupled with good social policy. It must recognize that opening doors to trade inevitably involves the pain of economic dislocation and job loss for uncompetitive industries. Governments have an obligation to address adjustment needs through training in new skills. It also obliges government support for industry restructuring, as Canada did with its wine industry after the Canada-U.S. FTA by planting grape varieties producing wine that was good for more than taking the paint off cars. 2. The Prime Minister should hold a First Ministers’ conference around a national trade promotion strategy. The Canada brand in the global economy is solid. We need to exploit it. Canadian services in banking, insurance, and engineering are efficient and trusted. We are global leaders in medical and energy innovation and digital technology. Canada ranks 14th in the Good Country index, defined by what each nation contributes to the common good of humanity.33 The OECD Better Life index accords us a similar high ranking.34 As a trading nation we have become a nation of traders, and we need to commit to continuous improvement. Our successful integration into North American markets, which account for almost 80 per cent of our trade, proves that Canadian business can successfully compete. We are meeting the Trump challenge by doubling down on our outreach and marketing into the U.S. Reminding Americans that Canada is their first market for 35 states and second or third for the other 15 states will help hone marketing skills that we need to apply globally. Given the fundamental role trade has played historically in raising and maintaining Canada’s standard of living, we need to open new markets and expand our existing base. Trade and investment promotion will always be the main drivers, but we should broaden our marketing scope to include tourism, a money generator and a precursor to attracting international students to our colleges and universities. As important as the U.S. market remains for Canada, the world trade map is being redrawn. The emergence of China specifically, and Asia more broadly, as a primary engine of global economic growth means a trade-dependent nation like Canada must adapt and adjust. This is a pivotal moment for trade policy in Canada. As history has demonstrated, nothing less than our standard of living and quality of life depend on getting it right. A former Canadian diplomat, Colin Robertson is Vice President and Fellow at the Canadian Global Affairs Institute, an Executive Fellow at the University of Calgary’s School of Public Policy and a Distinguished Senior Fellow at the Norman Paterson School of International Affairs at Carleton University. He is on the advisory councils of the Conference of Defence Associations Institute and the North American Research Partnership. Colin writes a column every two weeks on foreign affairs for the Globe and Mail and is a regular contributor to other media.